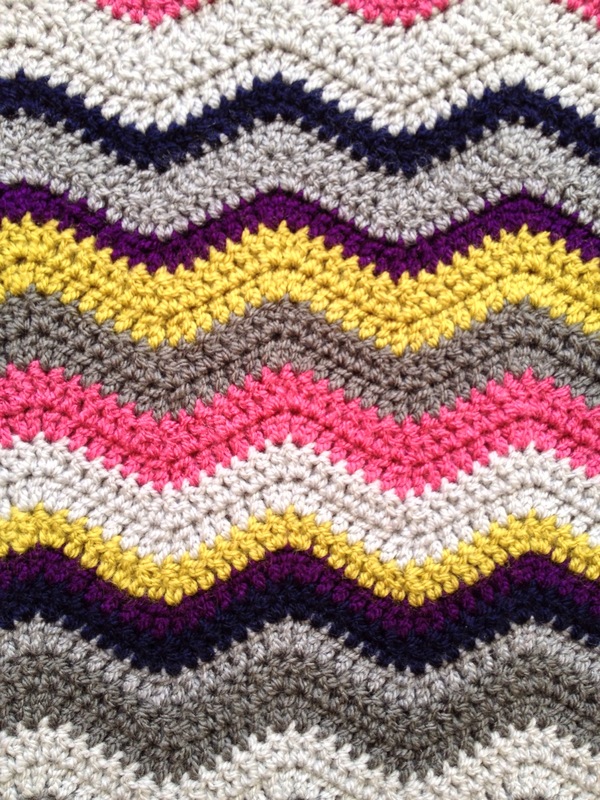 Zesty Raspberry Ripple Blanket – FINISHED! I did finish the rest of the darning in and the border on Monday night, just a day over my self-imposed schedule. Ya-hoo! I’m really pleased with this ripple. The colour scheme is different to any I’ve done before and that’s good – variety is definitely my spice of life! It’s soft and very warm. Initially I was just going to border it with trebles and simple rows of double crochet, I don’t think ripples need fancy edging or trim, but I started to want to do something a bit more decorative. 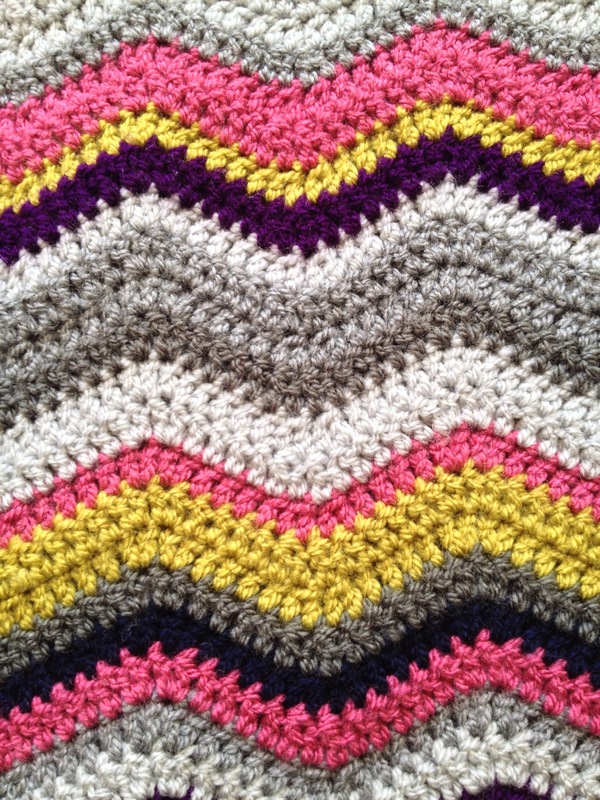 Then I remembered Lucy, of Attic 24 blog, had made some pretty edging on her Interlocking Ripple. This is basically a row of dc 1, ch 1, miss a st, dc 1, ch 1, miss a st and so on. Then you make a spike stitch when going along the next row. This is a dc which you think will be going into the missed stitch space, but actually pops into stitch in the row below the missed stitch. Easy! It sounds complicated but it’s not at all once you get going. With spike stitches you have to make sure your tension is relaxed, not too tight, not too loose – otherwise the whole edge with curl up, or the stitch will be a floppy loop. 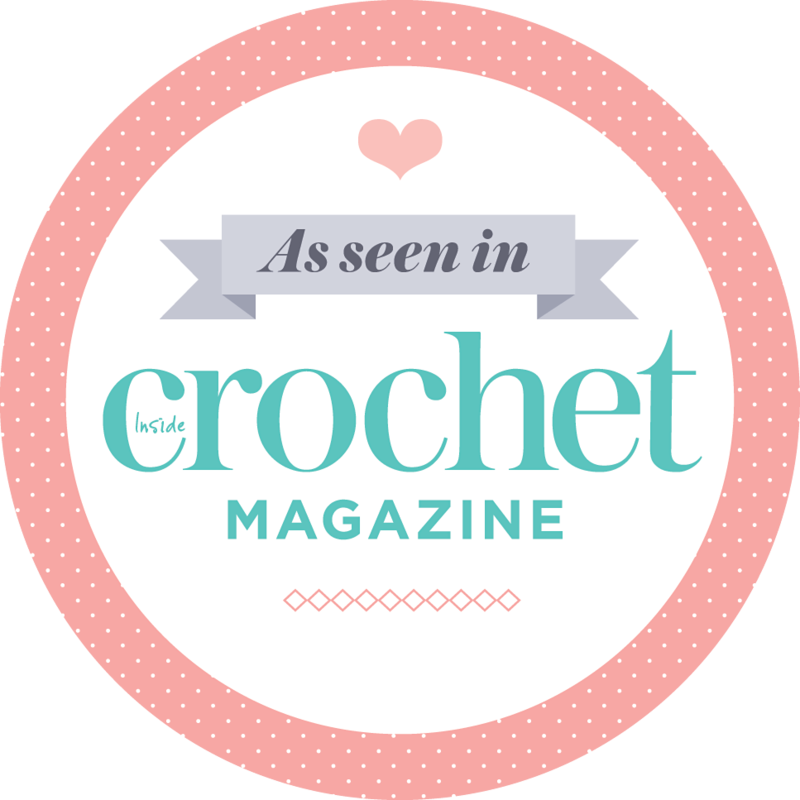 As I was on the home straight, and keen to finish, I double crocheted the last two rows bit by bit – the lime chasing the pink around the edge! For the corners I worked 2dc, ch 2, 2 dc in the pink but I found 1 dc , ch 1, 1 dc better for the lime row. Before wrapping the ripple I will give the border a steam block, just to make sure it’s all flat and relaxed. It’s a good finisher. Getting good photos has been VERY tricky with the dull weather, today it’s bright outside but very cold and damp. I didn’t want to risk the blanket getting dirty if I tried hanging it from the washing line. I came up with a good plan in the making – for the first half I grabbed yarn colours randomly, with a little thought but nothing that made my head hurt. 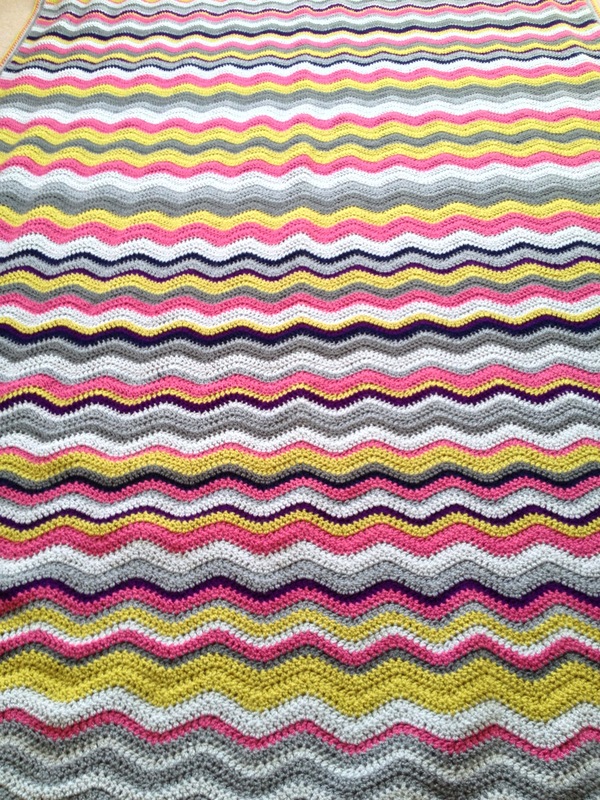 I’ve found while making blankets that by the halfway mark the whole thing is not as exciting. I just want to go on and finish. So, I crocheted another row and then just worked back through the colours, copying what had gone before. If you fold it in half on the middle row (of graphite) the whole blanket is symmetrical. I’m darning all the ends before I do any more of the William Morris motif blanket. During the making of this ripple I have reminded myself that it’s painful to leave them all till the end! 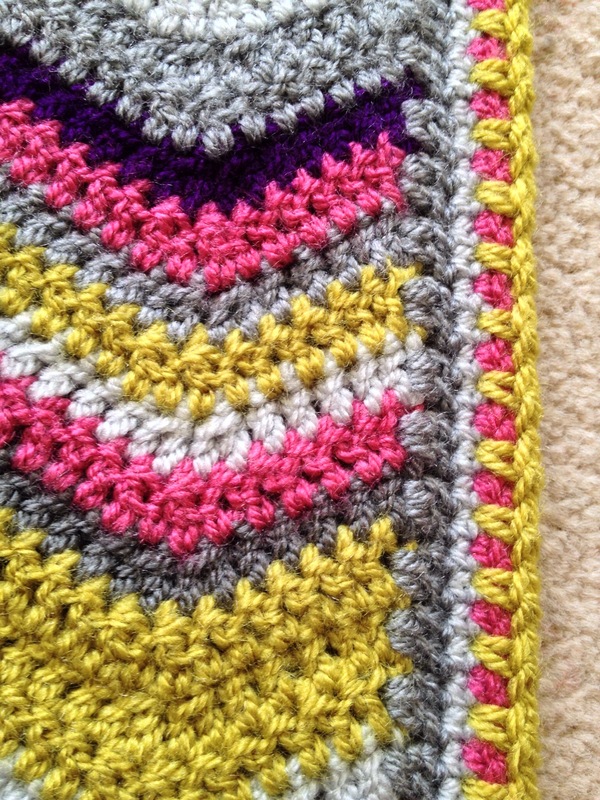 A lovely blanket with a pretty edging! I am finding photographs difficult too at present. I also agree about choosing the colours getting boring and did exactly the same working back through the colours for the second half of my ripple blanket. 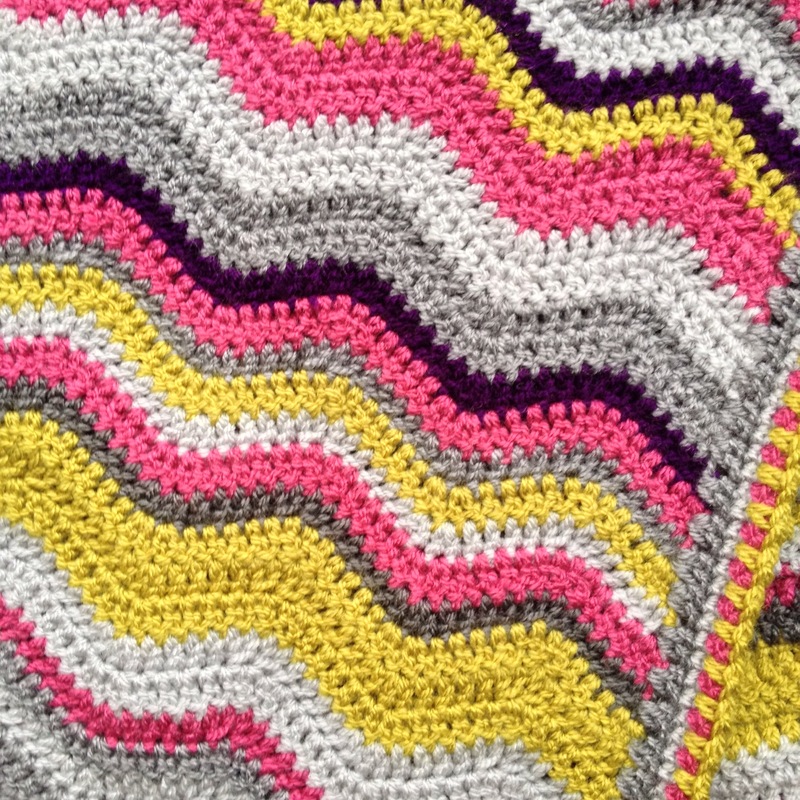 This is a splendid finished blanket! The edge is sharp and a terrific finish. Wow, an amazing blanket!!! I love the edging, and will make a mental note about it for when the day comes that I actually finish a big project like that myself. It always makes me smile sadly and shake my head when my blogging friends from the northern hemisphere complain about the bad light due to the bleak weather. I miss many things about lovely England, but definitely not the lack of sunshine ! Absolutely gorgeous. Hope you have a wonderful Christmas dear friend. Thank you Taci, and you too lovely.